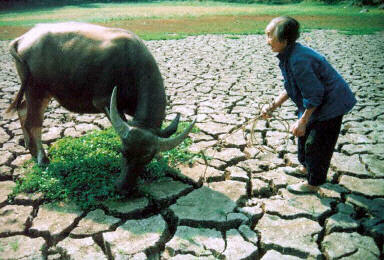 The current severe drought in south China, which had been predicted by American seven years ago? (See Figure above). In 2004, a site had ever reproduced the news, not unreal words. Afraid to lose the web site, I have remained the picture as evidence specially. The screenshot is above, please notice the designated part with red circles. At present, a severe drought has attacked southwest China. For three months, there has not been a drop of rain. Local people have been tortured so long. They look very miserable and pitiable. I am a native of Guizhou City, Guangdong Province, China. I have witnessed this with my eyes. I feel uncomfortable. The shortage of drinking water has become a common problem in the local villages and towns. While I grieved to see the people in my hometown suffer from the drought, I noticed an information on the net, it is said that the climatic damage in south of China had been predicted by some institutions of America in 2004. “Around 2010, the south of China will have experienced severe drought for ten years.” Meanwhile, “the north of China will suffer from floods continuously.” Unfortunately, the predictions have been conformed. It’s a big shock. But it also reminds us that we should attach great importance to it. Worst Drought in Fifty Years Hits South China, threatens crops and people’s life. Currently China has declared a top-level emergency for the country’s worst drought in five decades that has left more than 4 million people without proper drinking water. The crisis was raised to a level one emergency from level two late Thursday, the Office of State Flood Control and Drought Relief said on its Web site. That means the Flood Control and Drought Relief office takes control of the relief effort. It also triggers help from railway, civil aviation and other transport departments. OK, Let’s see this photo: Natural Disasters Pictures. 1. Wentuzh (First author who initiated this post) says：as far as I know, the regional climate for longer can not be forecasted accurately by the current levels of technology yet. Even if someone had said that, it must be non-scientific prediction. 2. Internet User Says: Spread rumors. 3. 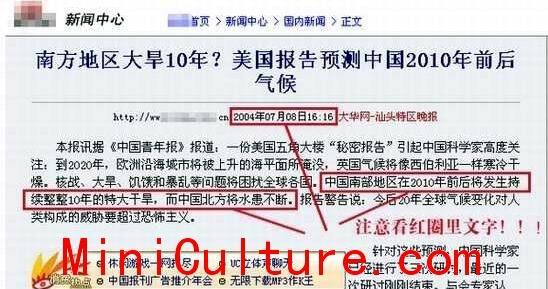 Chinese Netizen Loneliness says: In 2000, the US had predicted that China would be divided into 100 states in 2007. 4. Chinese Netizen Wright Cat Says: True or false? It doesn’t matter, live by day is the most important. 5. 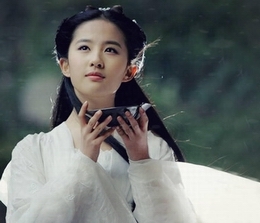 Chinese Netizen Claw Bens Says: drought in the south for ten years, and flood in the north for ten years?? That’s great! If it comes true, nobody will buy houses, the price must fall, that’s a good thing for the poor, like me. 6. Internet User Alice Lee Says: The rumors are ridiculous, but we must pay attention to the climatic changes, and put the energy conservation and environmental protection first. 7. Internet User bazu444 Says: God bless you. 8. Internet User Zhu Yuanzhang Says: The rumor is intolerable. If you wanna cause the discontent of the society, you’d better give up. 9. Chinese Netizen Liu Xuande Says: Actually you are a liar. Why didn’t the American predict their own natural disasters? Why didn’t they predict the 911 incident? It must be a coincidence, or you just told a lie.